I’m linking up with Megan for midweek randoms! 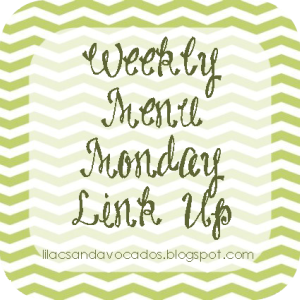 I love these link-ups because it’s an easy way to share my random thoughts/happenings in our life:) I will have to see how working full time and blogging goes. Right now, I’m able to write several posts a week, but that will have to slow down once I go back to school. ~Lil Miss is such a climber. 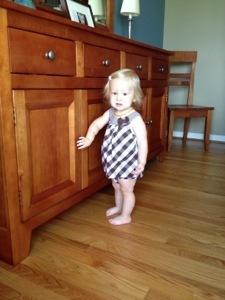 Recently, she has been into climbing onto the dining room chairs and then up on the table. She also climbed onto our neighbor’s picnic table yesterday evening. Will was not nearly as adventurous as Miss H. is (at least, I don’t remember him being such a risk-taker!)! 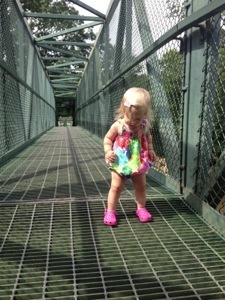 Notice only one shoe on-she decided it was fun to run and dance around like that! ~This week, my husband’s company had a “bring your kids to work” afternoon. Since Will and Harper were too young to participate, the company invited all of the younger kiddos to join in after work for ice cream and a tour of an airplane. Will wanted to stay in the plane and “drive it,” ha! A future pilot in the family, maybe? ~I am in search of ways to display my instagram prints. Lately, I have been using instagram A LOT (it’s just so more convenient to snap a pic quickly on my phone rather than lugging my big camera with me) and want to get some printed. I’ve never gotten any of them in prints before (I have included them in my kids’ photo books but haven’t gotten actual prints). Any suggestions on where to have them printed? And good ideas for displaying them? I guess I need to look on Pinterest!! ~Two and a half summer work days down, a half day to go! I worked a half day Monday and a full day yesterday at school. ~In thinking ahead to fall, I might get crafty and make some sort of wreath for our front door. I just need to check out Pinterest for something very easy. I’m not the craftiest person, ha! 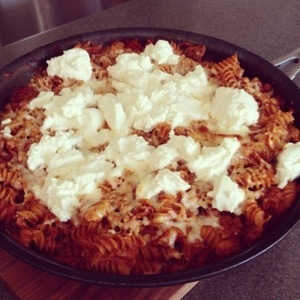 ~Over the weekend, I made a delicious and easy skillet lasagna that I mentioned in this post. Yesterday, I came across a one pot chicken spaghetti dish that looks as easy and yummy. I might try it out soon! Speaking of food, I’m going to make the Pioneer Woman’s peanut butter pie to share with our family this weekend. If you like peanut butter, you need to try it! It is so delicious! 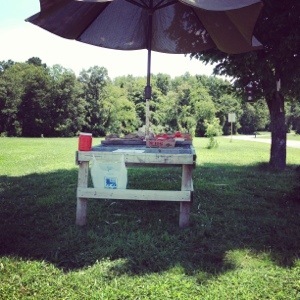 ~The other day while I was driving down a neighboring road, I came across this vegetable stand set up at a farmhouse. I noticed that they had corn, so I pulled into the driveway. I bought several ears of corn for .25 each and some tomatoes and cucumbers. It was on an honor system-you just put your money in the red container. So fun! We had a busy, fun weekend! On Saturday, Will and Harper’s grandparents (my in-laws) came to visit for the day. We spent the morning playing at home and just hanging out. 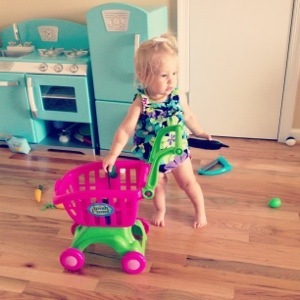 After the kids went down for naps, Mimi and I went out for a little shopping. 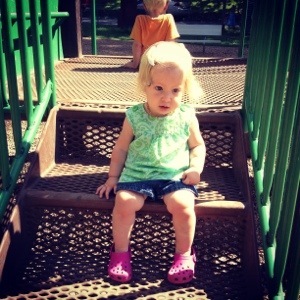 She bought the kids several outfits for fall (fun!). 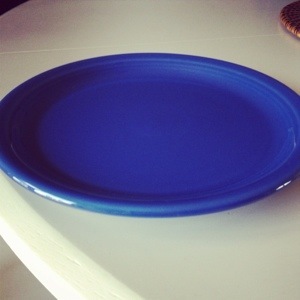 While we were out I found the newest Fiestaware color, lapis. I’ve been collecting Fiestaware since I got married and just love the colors! They come out with a new color each summer and I’m loving the lapis! 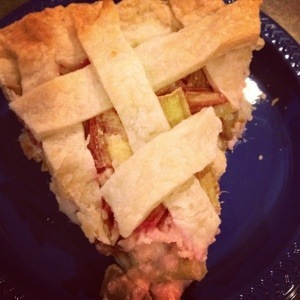 Mimi made some rhubarb pie, which the kids and I enjoyed today (my husband does not like rhubarb). It is interesting tasting but I love it! 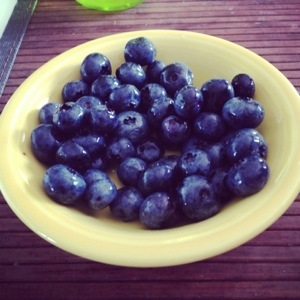 She also brought us several bags of blueberries that they picked at a local farm. Will and Harper eat blueberries like it’s candy! 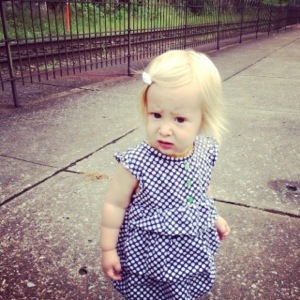 We went out to dinner with Mimi and Grandaddy to a local favorite restaurant of ours. 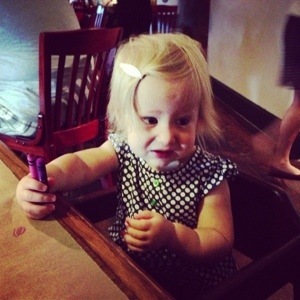 It’s very challenging to take Will and Harper out to eat. Our strategy is to order our food and then one of us goes outside to walk around with the kids until our food arrives. It always helps if the restaurant has crayons and paper to color:) We also ordered Will’s new LLBean backpack. I had a coupon code and Mimi had some other offers, so we got his backpack for $15.20. Yipee! Today, I tried out several new recipes I found on Pinterest. First, I made some yummy zucchini brownies with frosting. 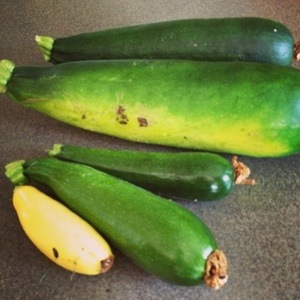 We have a small garden and when I went out the other day to check on it, I found some huge zucchini! Like baseball bat size! Ha, not quite but it was big! Anyway, I needed to find a recipe that would use up some of the huge zucchini (the smaller ones I usually roast or saute). I found a simple recipe for zucchini brownies, which turned out delicious! 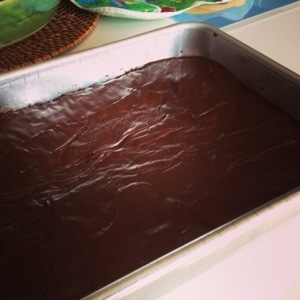 I’m going to take some of these brownies to Will and Harper’s babysitter tomorrow (I have to work a half day). We are having dinner at our friends’ house tomorrow, so I decided to make a lemonade pie for dessert. The recipe I use is similar to this recipe except I don’t use the food coloring and I make the graham cracker crust from scratch. 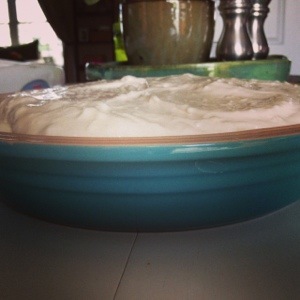 It’s not summer until I make my lemonade pie and a peanut butter pie from the Pioneer Woman!! 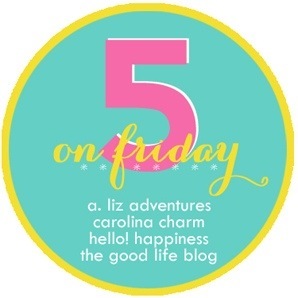 I’m linking up with Darci for Five on Friday! 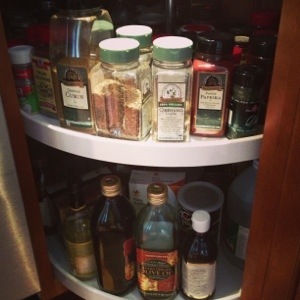 1-I really need to organize my spice rack. It’s a mess, and I found spices that had expired back in 2009! Oh my! There are just some spices that I don’t go through that fast, like smoked paprika and coriander. I can’t remember the last time I used those, ha! I cook and use a variety of spices, but there’s no way I can get through some of the spices before they expire. How bad is it to use expired spices? I’m sure I’ve used them plenty of times before-I always forget to look at the expiration dates on them. Back to organizing-I am searching for a better way to organize them…any suggestions? 2-This is one of my new favorite snacks: Trader Joe’s (of course! Ha-my addiction with all things Trader Joe’s!) Greek yogurt dip with cherry tomatoes. Delicious! 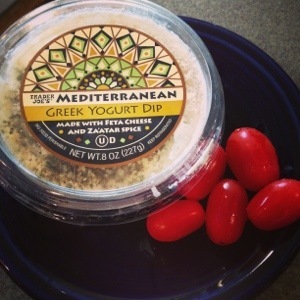 This dip is much better than the French onion dip I mentioned last week. 3-I finished my son’s third year photo book and have been waiting for a deal from My Publisher. This post gives more detail on how I create these wonderful keepsakes! They are currently running a deal that allows me to get three photo books for $39. 64 (includes shipping and taxes) each. 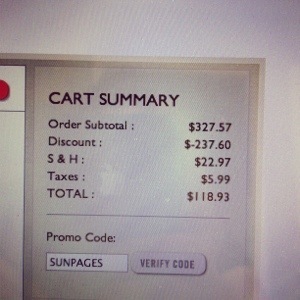 I saved $237.60! I would never pay full price, that’s just crazy! My Publisher is always running discounts and you just have to wait for the one that saves you the most for what you’re purchasing. This is the best deal for me since my photo books are 100 pages. I was able to cram in 580 some pictures of my son’s third year into those 100 pages! 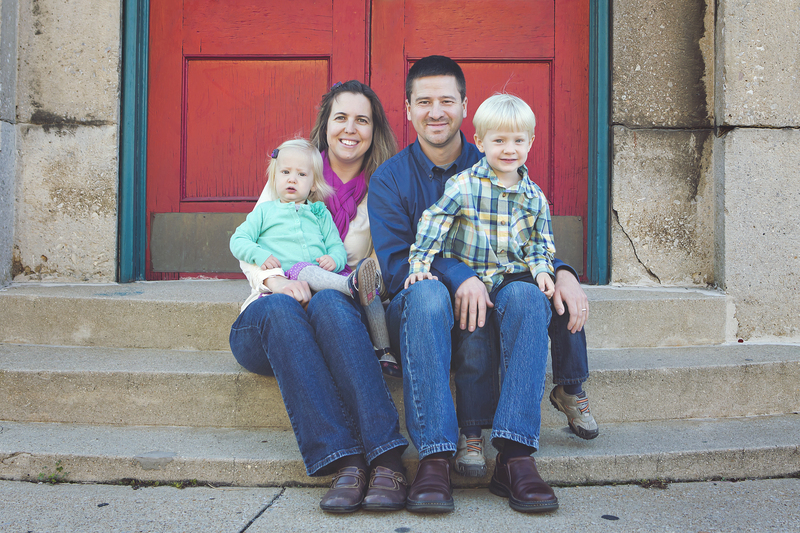 4-I signed up Will and Harper for a new program at our local library called 1000 Books Before Kindergarten. We record the books we read and turn in completed book logs after each 100 read. It’s a really neat program! I never knew before just how much I was reading to them (and how often I was reading the same book over and over again!). Miss H. has 16 books logged in and Will has 10 logged already, and we just started the program! One downside: It’s difficult to remember to document the books. I’m going to try to document each evening, but once school starts, it gets crazy around here! 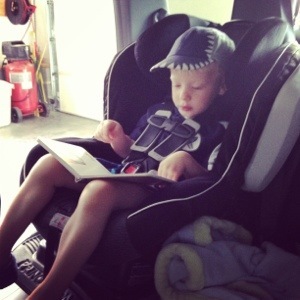 5-Speaking of back to school, I need to get Will a backpack for preschool (sob, sob). I’m looking at this Junior Original Backpack from LLBean, even though it says for ages 4+. I want him to be able to use it in kindergarten as well. Has anyone gotten this backpack? Suggestions? 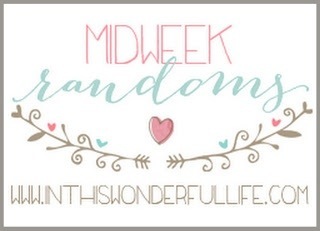 I’m linking up with Megan at In This Wonderful Life for Midweek Randoms! 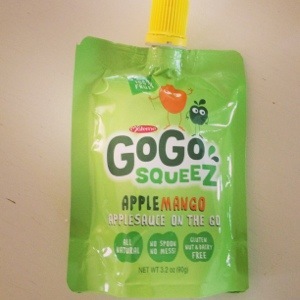 My kids go through so many of these squeezable applesauce packets. I’m thinking of investing in the reusable squeeze packets. It would save me tons of money and would be more eco-friendly. Has anyone tried the squooshi? Is there a specific brand you recommend? 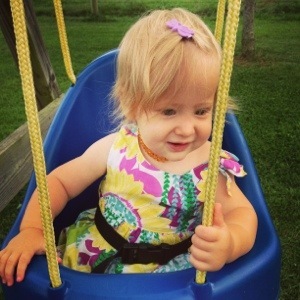 Miss H turned 16 months the other day…oh my, where has time gone?! It’s also very hard to believe that my son will be going to preschool two mornings a week in the fall! 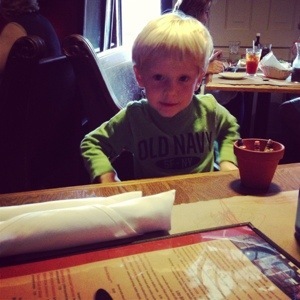 Before I know it, he will be in kindergarten! 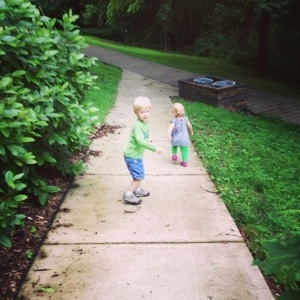 We are trying to fit in as much summer fun and activities as we can before school starts. My brother and his family will be visiting our parents in a few weeks and we plan on spending some time with them. 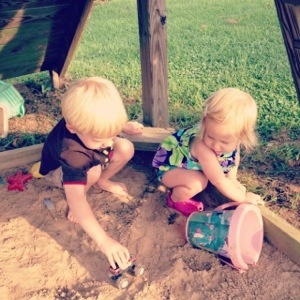 They live in Colorado, so Harper and Will only get to see their cousins once a year. 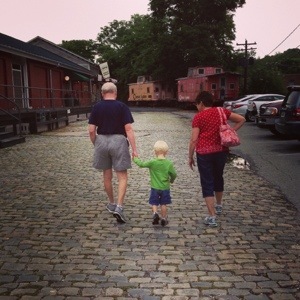 We’re planning several day trips to a scenic railroad and to a park for swimming and picnicking. Today is our ninth wedding anniversary:) We’ve been together for thirteen years! Wow, I’m feeling old, ha! 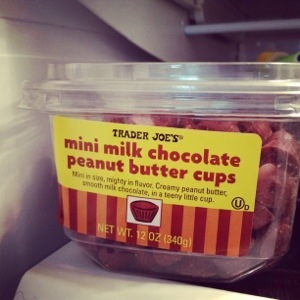 These mini peanut butter cups from Trader Joe’s are addictive! My husband and I are mildly obsessed with Trader Joe’s. if you haven’t been before, you need to check it out! A Trader Joe’s opened up last fall about 45 minutes from us and we frequent it! I might have to do a post on my favorite products from TJ’s sometime! I’m trying to find new and healthy recipes for my kids (and me) for breakfast. I might try some baked oatmeal or some healthy veggie muffins. We are getting tired of eating the same thing for breakfast! Any suggestions? I’m also trying to plan ahead for back to school. I pack breakfast and lunch for Will and Harper each day. I let them sleep as late as possible on school days, which means they eat breakfast at their babysitter’s. 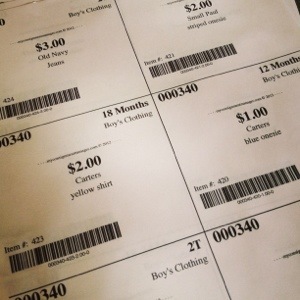 I love to find great deals on kids’ clothes:) Here are some tips on how I’ve found good deals and have made money selling Will and Harper’s clothing that they’ve quickly outgrown. ~I have sold my clothes at a few local consignment stores (including a chain kids consignment store) but this has not been the best deal. One of the stores pays you after your item sells, but if it doesn’t sell, they donate it. Another store pays you up front for the items and is very, very picky about what they accept. The money you do get up front is not as much as the 70% I get at the local consignment sale. ~I have also shipped some clothes to an online consignment site but was not happy with the small number of clothes they actually accepted (nothing was wrong with the other clothes I sent-no stains, no tears, less than a year or two old). I was not able to get the clothes back that they didn’t accept. 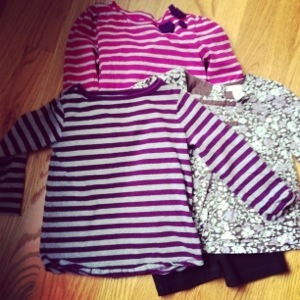 ~I have bought clothes online through ThredUp. Look for their free shipping deals and coupon codes. I recently received a $10 coupon code and ordered three nice long sleeve shirts for my daughter from Old Navy and The Children’s Place for less than $4 (I just had to pay for shipping). ~Below are a few items I recently found at a local chain consignment store. You really have to look around at the consignment stores to find good deals. Some of the clothes are way overpriced! Again, the best deals I’ve found are at the local once or twice a year consignment sales. ~Sell to your friends and co-workers! Just this past spring I sold several hundred dollars worth of clothes and baby equipment to a few friends and co-workers. It saved me lots of time (no tagging!) and money (I got 100% of the profits!)! 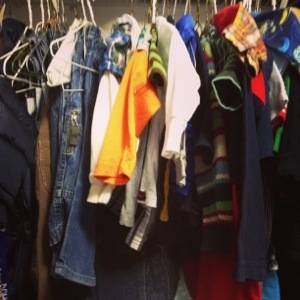 How do you save money on children’s clothing? Sunday: spinach quiche with hash brown crust and fresh fruit. I modify this slightly by using Trader Joe’s frozen hash browns. I love making quiche and enjoy the different taste of the potato crust instead of the typical pastry crust. I’ve also made a yummy quiche with a brown rice crust. Monday: tomato basil pizza from the Pioneer Woman, veggies and hummus. Love her recipes! As an aside, the Pioneer Woman recently posted about freezer cooking. 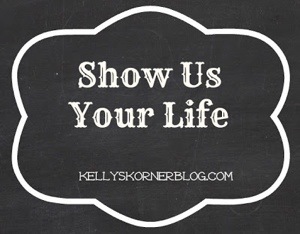 It’s a great post-check it out! Tuesday: Trader Joe’s orange chicken with sugar peas and mushrooms (from Rachel). 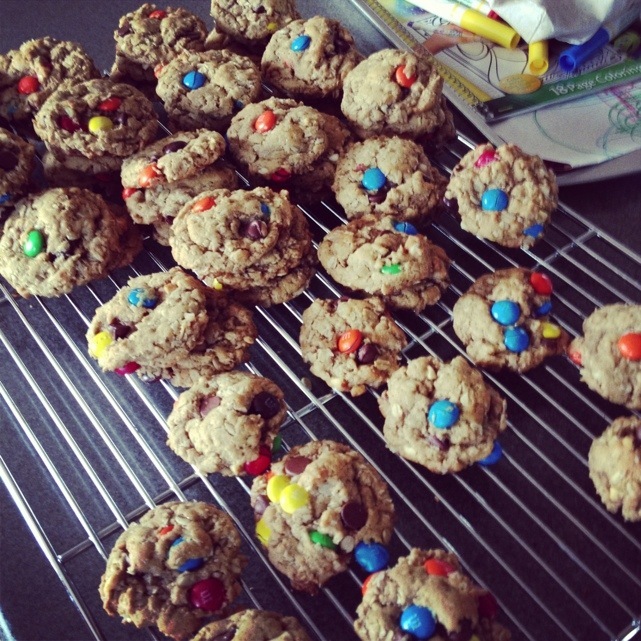 For dessert, I made these monster cookies from Recipe Girl. They were delicious! Full of peanut butter, oats, and chocolate! 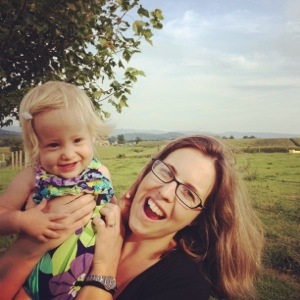 I’m linking up today with Kelly from Kelly’s Korner Blog! 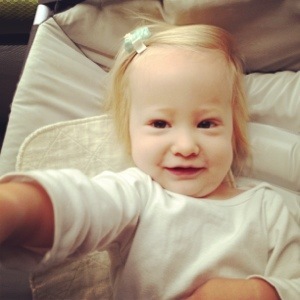 I just love reading her blog! It’s one of my faves! I love finding great freezer meals! Since I’m at home in the summer with my kids, I try to make lots of freezer meals for the fall when I’m back at school. I haven’t been that productive with that his summer (too busy having fun with my kiddos!) but I have made lots of good dishes over the past few years that freeze well. 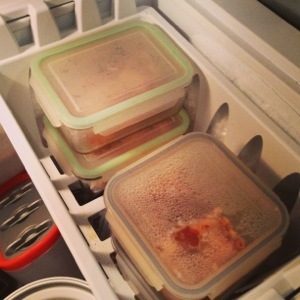 Throughout the year, I also try to freeze individual lunch portions for my husband and me to take to work. My hubby does not like to eat sandwiches (he says he ate WAY too many as a kid) and I’m not that big on sandwiches either. We always pack our lunches and typically take leftovers. Having the individual freezer portions makes it very easy for us to pack our lunches on busy days. One recent favorite recipe is honey lime chicken enchiladas from Six Sisters Stuff. 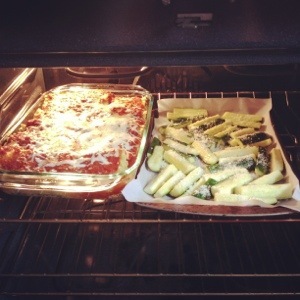 I love their blog-full of yummy recipes:) The honey lime enchiladas might be one of my fave dishes. I make it slightly healthier by adding several cans of black beans. Another good recipe to freeze is lasagna. I’ve been making lasagna rolls (I recently tried this recipe from Giada), which freeze well. I typically double the recipe and freeze one (I do this with a lot of meals; it’s a very easy way to stock up on freezer meals). I have a Pinterest board dedicated to freezer meals. 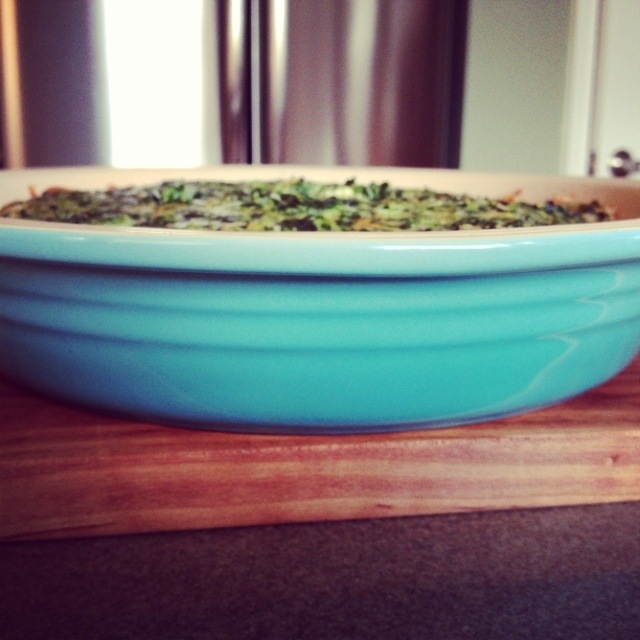 Check it out:) I have found some great tips on freezer meal cooking from Money Saving Mom. I haven’t tried a full day of freezer meal cooking but it looks like fun!